We recommend a number of trucking companies for delivery outside the state of Florida to all other parts of the continental United States. For a complete list, click here. Summer Schedule (June-Dec): We deliver state-wide on Wednesdays. APOPKA TUESDAY/FRIDAY MON. FOR TUES./WED. FOR FRI.
KISSIMMEE TUESDAY/FRIDAY MON. FOR TUES./WED. FOR FRI.
MELROSE TUESDAY/FRIDAY MON. FOR TUE./WED. FOR FRI.
ORLANDO TUESDAY/FRIDAY MON. FOR TUE./WED. FOR FRI.
WINTER GARDEN TUESDAY/FRIDAY MON. FOR TUE./WED. FOR FRI.
COCOA BEACH EVERY TUESDAY MONDAY BY 2 P.M.
DELRAY BEACH EVERY FRIDAY WEDNESDAY BY 2 P.M.
FT. LAUDERDALE EVERY FRIDAY WEDNESDAY BY 2 P.M.
FT. PIERCE EVERY FRIDAY WEDNESDAY BY 2 P.M.
JUPITER EVERY FRIDAY WEDNESDAY BY 2 P.M.
MELBOURNE EVERY TUESDAY MONDAY BY 2 P.M.
ROCKLEDGE EVERY FRIDAY WEDNESDAY BY 2 P.M.
STUART EVERY FRIDAY WEDNESDAY BY 2 P.M.
VERO BEACH EVERY FRIDAY WEDNESDAY BY 2 P.M.
WEST PALM BEACH EVERY FRIDAY WEDNESDAY BY 2 P.M.
CLEARWATER EVERY FRIDAY WEDNESDAY BY 2 P.M.
FT. MYERS EVERY FRIDAY WEDNESDAY BY 2 P.M.
NAPLES EVERY FRIDAY WEDNESDAY BY 2 P.M.
PARRISH EVERY FRIDAY WEDNESDAY BY 2 P.M.
SARASOTA EVERY FRIDAY WEDNESDAY BY 2 P.M.
SEFFNER EVERY FRIDAY WEDNESDAY BY 2 P.M.
Let us know if you do not see your city. 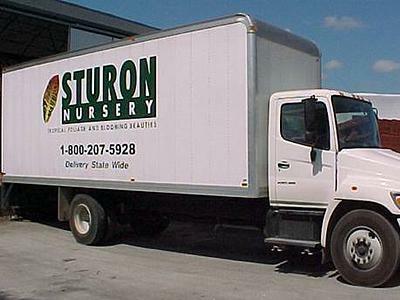 If your order is a full truckload, we will deliver to you on any day you need the delivery. 1) All prices are subject to change without notice. 2) All prices are FOB Miami/Homestead Fl.3) Terms are cash, unless credit has been established. 4) There will be a finance charge of 1.5% per month added to any unpaid balance older than 30 days. Any account that exceeds 60 days will permanently forfeit credit.5) We warrant to the extent of the purchase price only that all nursery stock is sold true as described, and falls within recognized trade tolerances. No other warranty, expressed or implied; and in no way will be liable for more than the invoice value at time of purchase.6) Our responsibility ends when the carrier accepts the shipment, claims for quality must be filed within 48 hours. Photographs must accompany all quality claims. All other claims must be filed with your carrier.